My suggestion is watch full screen with full volume for at least thirty minutes to achieve the proper immersive effect. 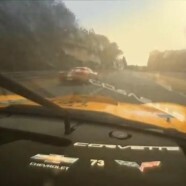 For years small boys and grown men have felt the Corvettes offer a key part of the Le Mans spectacle – yes the glowing brake rotors, yes the flames out of the exhaust, but more that mighty V8 bellow is what one thinks of when Corvette at Le Mans comes to mind. The video captures this, and also just how fast and narrow Le Mans is; check out how fast, how aggressively those Audis pass. If you are yet to visit Le Mans, I urge you to do it soon, before we loose the sound of high revving petrol powered cars, but also before the Corvettes change….